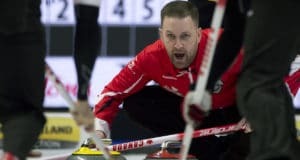 REGINA – With the disappointment of December still lingering for both Brad Gushue and Mike McEwen, they wrote a new chapter of their rivalry on the ice of the 2018 Tim Hortons Brier, presented by Mosaic, Monday night. 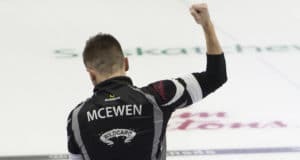 REGINA – With a wall of adversity in the past, Brad Jacobs and his Northern Ontario team are rolling along in the present at the 2018 Tim Hortons Brier, presented by Mosaic. 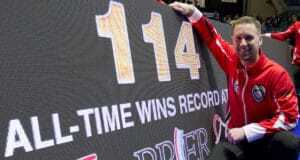 REGINA — His first win was against Saskatchewan, so it was perhaps fitting that his record-breaking win took place in Saskatchewan. 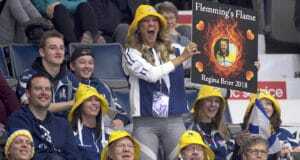 REGINA – The poster boys for the 2018 Tim Hortons Brier, presented by Mosaic, finally gave the home-province fans a win to cheer about. 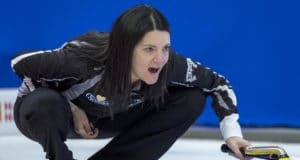 REGINA – If Jamie Murphy has any plans to pull off at the 2018 Tim Hortons Brier, presented by Mosaic, what fellow Haligonian Mary-Anne Arsenault accomplished last month at the Scotties Tournament of Hearts, he’s off to a good start. REGINA — Reid Carruthers is accustomed to walking off the ice and walking into a phalanx of media microphones following big-event curling games; it goes with the territory of being a skip. 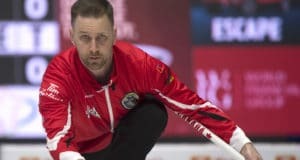 REGINA – In its first appearance as Team Canada, Brad Gushue’s team from St. John’s showed why it is the defending world champion. REGINA – The Battle of Ontario went to the north. Brad Jacobs and his Northern Ontario (Sault Ste. Marie) team defeated John Epping of Toronto 4-3 in the opening draw of the 2018 Tim Hortons Brier presented by Mosaic Saturday afternoon.